Q & A: Should I Buy a Wide-Angle Lens Attachment? Q & A: Wide-Angle Lens Attachment, or Wide-Angle Lens? Q: I am looking at buying a wide-angle lens for my Nikon D5000. Is this (pictured below) what I would be looking for…or is it junk? It’s only $59! This particular “lens” is simply an attachment that you screw onto the end of an existing lens. 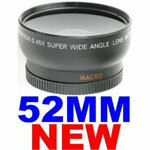 The 52mm, in this case, refers to the diameter of the lens on which you would attach it…in other words, it only fits on lenses with a diameter of 52mm. You can find wicked cheap lenses on eBay (along with expensive ones), but generally the cheaper lenses tend to be made by overseas third-party manufacturers and are of poor build quality with less-than-pristine glass. I wouldn’t recommend going that route. You’re looking at a minimum of several hundred dollars for a semi-decent wide-angle lens with prices going up into the thousands for something of high quality. You may want to check out lenses at B&H Photo. They are pretty good about keeping their selection to quality lenses (versus places like eBay where people are trying to pawn anything and everything, whether it’s quality or not), so I sometimes just window-shop there and buy the lens I want elsewhere if I find a better price. B&H‘s search features allow you to narrow down the selection to show only those lenses available for a specific make of camera (e.g. Nikon, Canon), lenses with a specific focal distance, etc., which helps a lot. I know Sigma has a few wide-angle offerings in the lower budget range as well as Bower, Rokinon, and a few other manufacturers. JUST A NOTE: Anytime I’m looking at new equipment I read a million reviews, both on the seller sites as well as photography equipment review sites and forums. While seller sites are great to see what others’ experiences have been after purchasing an item, photography blogs, discussion forums, and equipment review sites can provide invaluable insight into why somebody did not purchase a particular piece of gear. It’s lens “flare”, not “flair”. Home » Q & A: Wide-Angle Lens Attachment, or Wide-Angle Lens?